In January on a freezing cold day I welcomed an absolutely gorgeous group of women to the cosiness of my studio in Kent. It was actually the last day in the studio before the big revamp and so I tried to palm off various unwanted bits of furniture! Usually everyone gets to forage in the garden but they all looked a bit relieved when I said I had foraged enough for them if they wanted to stay inside.... On this occasion every attendee was a florist and so we were all able to have a good long gossip about our businesses and how we work. Everyone was so talented and able to bring their own edge to the wintery selection of blooms on offer. I try to be a completely open book during workshops and so we covered everything from social media to how to charm wholesalers. Everyone's final work had a deeply romantic feel to it, perfect for this Valentine's day run up. We followed the usual pattern of bridal bouquets in the morning (all finished with gorgeous Kate Cullen ribbon) and lush table centres in the afternoon. Lunch is a simple affair in the oldest room in the house - 12th century I believe! 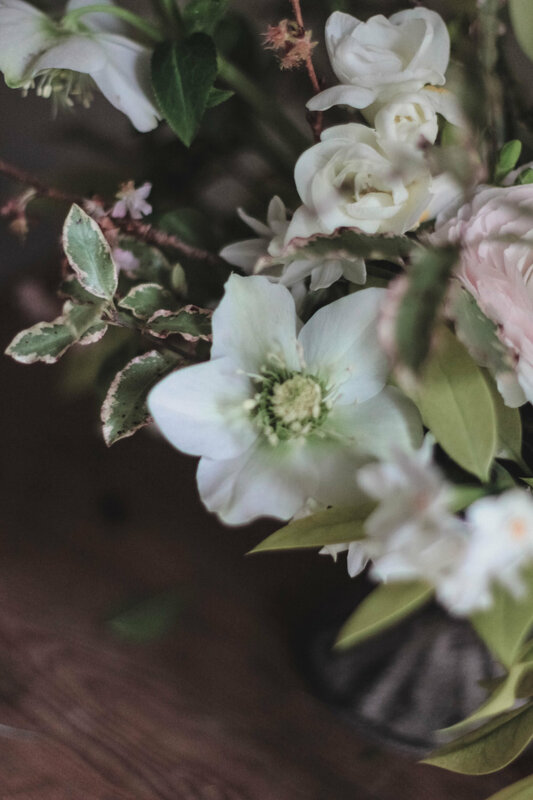 The studio sits separate from the house and is a typical Kent barn, it has been a god-send since we moved here, perfect for my work as a wedding florist as well as for these workshops. I can't wait to show you some pictures when it is completely finished. Please read more about our workshops here and get in touch if you would like to attend! Oh and thank you Sarah - I pinched one of the pics below from your instagram.